Moody Monday's theme this past week is Beach. While there may be a few spots along the Maine Coast that have some sand beaches, much of the coastline looks more like what you see above. These shots were taken in Rockland in early spring 2008, shortly before everything started growing again. Each of these autographs was the result of a random encounter my parents had with these baseball icons. The menu in the background is from the restaurant where my dad met Curt Flood (the autograph is on the flip-side) during his brief stint with the Washington Senators (13 games in 1971). Anyone that ever benefited from free agency in baseball ought to be tithing something to Curt Flood's estate (or at the very least to a charity in his name). My mom ran into Sandy Koufax while skiing in Maine at some point in the 1970s. 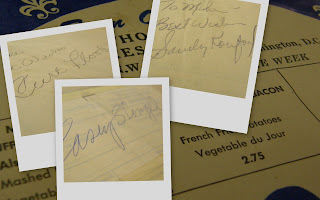 The Casey Stengel encounter is the only one I have any regrets (which is, perhaps, too strong of a word for the feeling) about because I was supposed to be there. This occurred at the 1969 All-Star game at RFK Stadium in Washington, DC. We were living in Silver Spring, MD. My dad had gotten tickets and I was supposed to go to the game with him. Alas, that week I came down with, if memory serves, the German Measles (chicken pox and mumps had already had their turns with our family) and could not attend the game. The autograph was a wonderful consolation, but I was still extremely disappointed (what 8-year-old baseball fan wouldn't be!) that I wasn't able to actually be at the game. What an eventful 10 days that would have been (still was, actually)! My brother was born on the 13th. Apollo 11 Launched on the 16th. Neil Armstrong walked on the moon on the 20th (I remember watching, riveted to our old black & white TV). The All-Star game was scheduled for the 22nd, but rained out and played on the 23rd. Submitted to Macro Day's Handwriting challenge and See It Sunday's Retro challenge. Submitted to Shutterday's Grass challenge. Our friend Timmay plays a real smooth operator in the New Surry Theatre Production of Last Of The Red Hot Lovers, April 12th, 2008. Submitted to Unique's photo challenge for Smooth. This Budweiser ad cut-out/poster is interestingly illuminated at the Time Out Pub. Submitted to Thursday's Bright challenge. Submitted to Lens Day's Private challenge. Submitted to Shutter Day's Iron challenge. Picked for submission to Macro Day's Nose Challenge. I'd have to say that this is the largest number of deer I've ever seen at one time. I counted a dozen spread out grazing in this field. I'd stopped on my way back from the store after spying them out of the corner of my eye. I'd have liked to have gotten closer, but I didn't want to drive them away. Taken just after 1AM one night last summer. Submitted to Unique's Photo challenge for Taking it to the Streets. Even after midnight there are usually cars parked in this lot. It was a rarity to be able to take this shot one night recently. Submitted to Shutterday's challenge for Flat. Photo evidence of our friend Judy spray painting (with a roller, no less) herself (and the fence, for good measure, while she was in the vicinity) provided by guest-photographer Jenny Why_Me. Submitted in her name to Photo Friday's challenge for Tools. The first two are in downtown Orono. The one below is over Penobscot Hall on the University of Maine Campus in Orono. These sunset shots are of the Stillwater River taken from the bridge that links downtown Orono with Marsh Island. Submitted to Thursday's Fun challenge.